They say the nut doesn’t fall too far from the tree, and in Central Florida that usually means you have cattle ranching in your DNA. That’s true for Kayla and her father Waters, but it also means the cattle ranch finds its way into their artistic expressions. Mr. 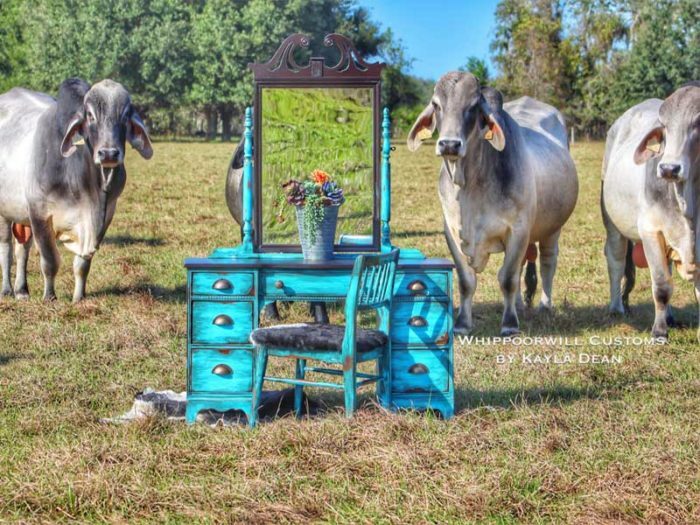 Waters runs cow-calf operations in three separate Florida counties and paints a pastoral scrubland or a massive Brahman whenever he gets the notion. His daughter, Kayla, runs her own offshoot of the family cattle ranch with her husband and children, and finds time in between being a cattlewoman, wife, and mother to refinish furniture, usually incorporating themes and visuals from the ranch. Explore the artwork and passions of this duo who see beauty and inspiration in the ag way of life and put that love into their creative endeavors. Ned’s go-to medium is acrylic paint on canvas, and he paints those things around him. “It’s all Florida,” he said of his art. “It’s cowboys and wildlife, and landscapes of Florida; it’s all things around here.” Ned’s paintings have found homes far and wide, from his own home and the homes of his daughters, to museums, agritourism venues, in the Florida capitol building, and even out in Nevada, helping to set the right mood at the annual National Cowboy Poetry Gathering in Elko. “My dad and my husband love natural wood, so most of our home is pine and cypress,” she explained. “I am not a huge fan of natural wood and love bright colors and patterns. I decided that I would just fill the house with bright colored furniture and decor. I quickly figured out that it’s hard to find turquoise and serape painted furniture and that it is way out of my budget!” Home with two young children, she one day decided to refurbish an old desk her husband had brought home, painting it in her favorite turquoise. “I put it up for sale on my Facebook page and it sold immediately for asking price,” Kayla shared. The future holds a lot of promise for both Ned and Kayla’s artistic endeavors, but one event that needs to be in the works is a compilation between father and daughter. “I would love to do that,” Ned shared, “maybe one day we will.” Kayla is in agreement all the way. “We have talked about me refinishing a piece of furniture and him painting a scene on it,” she explained.